Hye guys!!!! I am trying to explain every single person’s point of view towards the condition of Sukanya and family but slowly and in parts just understand that and be patient. Please….. every character is important and so are their views. Hopefully you guys will like the story and please comment graciously. They are my ultimate strength boosters…. Hours passed by but there was no sign of improvement shown by Sukanya every passing second just kept reducing the chances of her survival. Every minute turned out to be more difficult then the previous one. Time felt the most heaviest thing at the moment. Anika was sitting outside the operation theater placing her head on Shivaay’s shoulder while Om was silently sitting with them. Om had seen his family in the condition in a hospital many times before too and nothing was different today just the person inside the operation theater. Fear of loss is greater the the loss itself and nobody accept for him has been every able to understand this in a better way. He has seen so many important people of his life fighting death including himself that he sometimes feel like giving up on the entire scenario but something within him always stops him not because of the love he has for the particular person but because when everything ends the ending is more often beautiful. Though today inside the OT is Sukanya but a few years back his wife and daughter too were there and today again he feels the same amount of fear or tremendous fear because today there are more life’s dependent on that one single life that is fighting death. His heart is constantly praying for the little girl he got to know is his niece just a few months back but she has his heart. She is a magician according to him because because of her only their family came together and if anything happens to her they all would be nothing but the shards of the family. The mere thought of which is a nightmare. Sitting under the dark sky besides the pool stood the brother who so badly wanted everything to fall in place. He had spent nights sitting by the pool just crying and yelling to himself or complaining to God. Today again he is at the same place weeping in his hands wishing for everything to either fall in place or just in a snap of moment he would be told the previous 24 hours were nothing but a nightmare. The moment he saw Sukanya completely wet in Shivaay’s arms lying lifeless his world came to a stand still, it felt as if pain of previous 15 years had hit him in one single blow all of it together. Rudra though was a baby to his elder brothers but 15 years had changed him into a mature man but all he wants is too shout and tell everyone the life he is living is just a burden on him and once again he wants to be the cry baby that he once he hated to be called. But if the price is his happy family he will pay what ever it costs even his life. A hand on his shoulder makes him turn in alertness and soon he turns the other way and rubs his tears off and with a smile turns to his daughter. Anya: Why are you crying papa? Rudra sniffing in denies: I am not crying Anya. Why aren’t you sleep? Anya: Mumma slept while making me sleep and I wasn’t able to sleep so I came looking for you. Rudra smiles at her but the jovility was no where to be seen. He knew there were time when he use to fake cry just in order to convince his brothers and now he has to lie about his very genuine tears too. He picks up Anya and makes her sit on his lap. Anya: Papa, Sukanya di thik toh ho jayenge na. Rudra looks at her with pain in his eyes but somehow manages to nod: Haan beta, Sukanya di puri tarhan se thik ho jayenge aur vo jaldi ghaar bhi vapis aa jayenge. Anya flashes the brightest smile towards her father and she throws her arms around his neck while Rudra hugs her back allowing his daughter to sooth his aching heart. He knows what a daughter means to her father, with how much devotion and purity they love each other and no bond in the entire world is capable enough to replace the love they share. He knows what Shivaay would be going through and how difficult it would be for hm at the very moment. Even a single scratch on Anya’s body makes him scream and on the other side Sukanya is going through so much. Rudra’s heart bleeds remembering Sukanya and the very moment all he wants is to see Sukanya. They might have not been together for previous 15 years but she has been with him for months now and all he wants is to see his daughter completely fine. He picks up Anya and pats her till she falls asleep and after tucking her in the bed he leaves a message for Bhavya by the side of their table and leaves for the hospital. Nitya: Abeer you should leave now. It’s too late. You haven’t relaxed for a second. You had sent me to rest and now I am back so I will do this. Abeer smashing the file down: No Nitya you can’t do this I have to. Nitya: Come on Abeer you can’t go on like this. Just go and have some rest I will take care of everything here. Abeer yells at Nitya: No I can’t. Sukanya is fighting there for her life. I have to figure out what’s going on in Daksh’s mind. I can’t see her like that and I can’t spare that man. Nitya rubbing Abeer’s shoulder: I understand but you can’t exhaust yourself like this. Abeer sighs: I can’t relax till I figure out what’s next. You didn’t see Sukanya’s condition when she was in that container, Nitya. I saw her. I know Daksh won’t stay silent and I even know that Aditi and Krish’s life is at risk too. I can’t sit calmly just waiting for Daksh to continue his destruction. At the moment the duo hear a knock at the place so Nitya goes to open the door and escorts Devika inside. Abeer touches Devika’s feet to take blessings from her. Devika nods and sits on a chair near Abeer: Kya baat hai Abeer tumne mujhe itni jald baazi mai kun bulaiya aur vo bhi yahan. Abeer looks at Nitya who nods in agreement and Abeer taking Devika’s hand in his explains her about everything starting from the photographs he saw in the album to the incident that took place with Sukanya, leaving the custody part. Devika rubs the tears off her eyes and drinks the water that Nitya gave her: Mai tumhe sab batati hun Abeer. Magr uss se pehle mujhe Armaan aur Damini se milna hai. Nitya: Armaan uncle aur Damini Aunty se kun? Devik: Tumhe sab pata chal jayega beta. Ye kahani aaj nahi kahin saloon purani hai. Armaan, Devika, Rajeev aur mai hum sab se jodi hai ye kahaani. Kunki Rajeev a ab zinda nahi hain toh unki kahaani mujhse behtar tum logon ko Armaan bata sakenge. Nitya: Thik hai magr hum yeh baat sabke samne karenge toh behtar hoga. Abeer: Tum sahi keh rahi ho. Jab bhi humne ek dusre ko bachane ke liye koi bhi baat chupayi hai hamesha kuch galat hi hua hai. Rudra walks in the hospital and goes directly towards Sukanya’s ward. Om on seeing him comes to him. Om: Itni raat ko tun yahan kya kar raha hai? Rudra: Om mujhse ghaar par nahi raha ja raha tha. Sukanya, bhaiya aur bhabhi ki bohaat fikr ho rahi thi. Om hugs Rudra understanding his inner turmoil. Both OmRu turn towards a surprised Shivaay. Shivaay: Rudra tun yahan kya kar raha hai. Rudra stutters unable to decide what to tell Shivaay. There was once a time when he could have said whatever came in his mind to Shivaay but today situations are different. They are 15 years different. But still the fact that can never change is they are brothers and Shivaay doesn’t needs his brother’s words to explain their situation to him. Shivaay walks forward and takes both his brothers in his embrace. Shivaay: I really need you guys. OmRu hug him back tightly and they all cry nodding. He says forwarding his hand and Anika runs into the O Bro hug with tears rushing down her eyes. Anika: Vo thik toh ho jayegi. Om nods: Bilkul bhabhi. Shivaay hai na. Shivaay looks into Om’s eyes that just said ‘it’s high time’ and Shivaay nods. They all sit together waiting for the doctor to come out and inform them about Sukanya’s condition. It’s not till 5 O’clock in the morning that the doctors come out. Shivaay: Doctor, how is Sukanya. Doctor: She is out of danger Mr. Oberoi (everyone sighs in relief) but due to her heart condition she is critical. We have saved her but she needs to take great care of herself to recover and please make sure that she doesn’t takes stress because any kind of tension can be traumatic for her worsening her condition. We will keep her under observation for few days and we will continuously monitor her health and after that only we will decide about her medical condition. She will wake up after 8 hours as she is under sadiative effect. We will shift her in the ICU and then you guys can see her. Anika: Shukar hai bhagwaan kaa. Rudra: Bhaiya, bhabhi, Om aap teenon ghar ja kar fresh ho jao aur thoda araam kar lo. Please…..
Shivaay: Rudra tun bhi humare saath chalega kunki tune bhi rest nahi kiya bilkul. Anika: Shivaay mai nahi jana chahti yahan se. Shivaay: Anika please abhi chalte hain aur ek ghante mai wapis aa jayenge. Please…. Om: Thik hai fir mai Gauri aur Bhavya ko kehta hun ki vo dono chote papa ke saath aa jayain yahan. Everybody is informed about Sukanya’s well being and they all are relieved. Last night was difficult for everyone none could sleep properly but where dadi slept under the effect of her medicines others slept due to utter tiredness and overwhelming of the day but none slept peacefully. While few just stayed in the bed with their eyes closed but sleep nowhere to be found on other hand Atharv and Manik talked through the night making each other believe that will be Sukanya’s fine soon. When Atharv was told about Sukanya’s well being he literally begged his parents to go along with them so they agreed on taking Atharv with them once they go back to hospital. Though other kids too wanted to accompany but they were convinced by saying that once Sukanya wakes up everyone can go meet her. After an hour when Shivaay, Anika and Atharv were about to leave Abeer and Nitya comes home along with Devika and on seeing Shivaay there the first question Abeer has is about Sukanya’s health. Shivaay: Calm down Abeer, Sukanya is fine. Anika: She will wake up in the afternoon. Anika: Nothing much. Doctor just said that they will keep her under observation till they are not sure. Devika looking at Damini And Armaan: Damini….. Armaan bhaiya…. Devika and Armaan share a look and both in shocked voice say: Devika bhabhi/didi. Devika nods while Damini hugs her. Damini: Devika didi aap yahan kaise? Damini looking at Atharv: Atharv beta aap andaar jao mujhe kuch zaroori baat karni hai. Atharv nods and goes upstairs to accompany other kids. Damini: Kya baat hai didi. Devika looks at Abeer nervously but he nods to comfort her, taking a deep breath Devika continues: Ragini ke bare mai toh aap sab jante hi hain. Shivaay: Ji. Magr aap sab kya baat kar rahe hai aur Maa ko aap kaise jante ho Ayi. Armaan: Devika mere bachpan ke dost Rajeev ki patni hain. Rajeev aur mai ek school mai padte the. Devika: Haan yeh sahi keh rahe hain Shivaay. Mere pati Rajeev jis orphanage mai bade hue hain usi orphanage ke malik ke bete hain Armaan bhaiya. Shivaay: Vo toh thik hai magr aap itne uncomfortable kun ho. Devika turns towards Abeer and Nitya and Abeer comes forward to explain. Abeer: Mai bata hun sab kuch Shivaay. Jab hum yahan shift ho rahe the tab mai Ayi ki madat kar raha tha unka saman sambhalne mai tabhi unke pass se ek album mile jis dekhne ke baad mujhe realise hua ki Ragini ne humse jhut kaha hai. Abeer: Yahi ki usne jo bhi kiya vo sab usne apni chachi ke kehne par kiya jabki saach toh ye hai ki uski koi chachi hai hi nahi. Nitya: Infact Rajeev uncle yani ki Ragini ke dad toh ek orphan hai. Devika: Yeh sahi keh rahe hain beta. Shivaay: Okay fine…. but iss sab ka kya laina dena hai abhi. Abeer hum ye sab baad mai bhi discuss kar sakte hain abhi Sukanya ko humari zaroorat hai. Abeer: I understand Shivaay par ye bohaat zaroori hai. Shivaay nods in disagreement: I don’t think so. Aryan who was quite clearly able to interpret the situation felt his head spinning and he drops his body with a thud sound on the sofa, making everyone worried. Om is the first one to come forward and support Aryan. Om: Are you alright Aryan. Aryan looks up at him with his eyes red in pain and then turns towards Abeer knowing what questions are going on in his head: Daksh was Ragini’s first husband. No sooner all of them had their minds flipping. Abeer turning to Devika: Ayi please tell us Ragini ye sab kun kar rahi hai. Rudra: Magr vo naagin toh chali gayi hai. Abeer looks at him and nods in disagreement. Aryan standing up with determination speaks: If Daksh is doing something he can’t do it without Ragini’s help. Devika: Thik mujhe nahi pata ki Daksh ye sab kun kar raha hai par mujhe ye pata hai ki Ragini ye sab kun kar rahi hai aur ye bhi janti hun ki use roka kaise ja sakta hai. Gauri: Kya chahti hai Ragini aur hum use kaise rok sakte hain ayi. Shivaay: Mujhe saach mai kuch samajh nahi aa raha. Please koi saaf saaf bata batayega kya ho raha hai. Abeer nods: Shivaay, Nitya ne Mumbai mai shayad kahin par Daksh ko dekha tha par vo sure nahi thi. Yahi baat batane ke liye she came to Dehradun but she wasn’t sure, so she thought that first she will be sure and only then she will inform us. Meanwhile, you flew to NYC and we all came here at that time only we got to know about Ragini’s lie and I just became curious and angry then I was reminded of Nitya’s behaviour the day she came she wanted to tell us something but she didn’t so I confronted her and then she told me about Daksh. Somehow I knew Ragini and Daksh were connected (he looks at Meher for a second with a short eye contact he turns back to Shivaay and continues) and then I was worried for you and everyone I knew if Daksh is back he will ruin is. He left no stone unturned previous time too (Shivaay nods understandingly) so we just came to NYC and got you guys married because you guys were already too stressed up and so much had already happened and I really wanted to see Atharv and Sukanya happy and I knew there happiness was in your togetherness so Nitya and I made that stupid story to get you guys married. By that time Nitya and I were trying to trace down Daksh and Ragini and any threat they were going to pose us. But before we could know it was too late. Now we really need to know why are they doing this and what do they want. We have to stop them because this time if they do any harm we would be left in shreds. None of us has recovered from the previous harm. Whether it’s Pankh, Vatsalya, Maa, Armaan sir, Aryan, you or Meher and me. We couldn’t even protect our kids how much ever we wished too. He says looking at every person in particular and finally looking at Meher whose eyes now just reflected fear. Pankhuri was already in enough distraught situation. His own eyes hold pure pain and vulnerability. Shivaay nods in agreement he knew whatever Abeer is saying is true. Though he hates to agree but it’s true: Why is Ragini doing all this. Armaan looking at Devika understood her dilemma, he knew this was the time to reveal the secrets. Though he didn’t wish to but if it somehow helped the family he found so close to his heart he will say everything. After all he found peace and so related to all of them: Aaj se kareeb 35 saal pehle ki baat hai. Rajeev aur mai hum dono bohaat khush the humara chota sa parivaar tha aur humne ek dosre ke saath mil kar ek business shuru kiya tha. Uss waqt Devika bhabhi aur Rajeev ki do betiyan thi Ragini aur meri bhi do betiyan thi. All look at him being shocked Shivaay, Abeer and Nitya never knew about this though they were very close to the Awasthi family but they never knew about their past. They were equally shocked to know about Ragini’s sister. Devika nods looking at every person’s confused face: He is saying truth. Ragini isn’t my only daughter. I had two daughter’s Ragini and Dyuti. 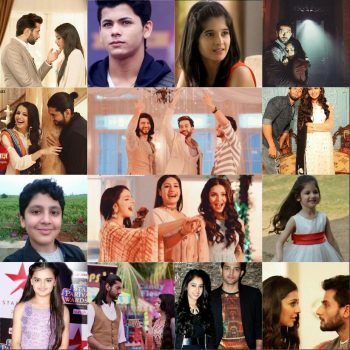 Damini and Armaan bhaiya too had two daughter’s Surbhi and Naumi. Ragini and Surbhi were around 10 years old while Naumi was 7 and Dyuti 6 years old. They were best friends. Around that time Rajeev and Armaan bhaiya got two great deals and they both decided that Armaan bhaiya will take care of the deal that had to take place in Delhi and Rajeev stayed back here to crack the deal with….. (She looks up towards Tej who looked expressionless or more precisely was passing his ever so arrogant expression. She takes a deep breath in annoyance seeing the same expression on his face.) With the OBEROI’S. “WHAT??? ?” Almost all of them snarled and Devika nods. WHAT THE DEAL LEAD TO???? WHAT IS IN THE ENVELOPE????? I know this part might be very confusing but all the confusion will get cleared super soon. Next update might be on next Sunday. So stay tuned and keep commenting…..